Three games coming on Weekday Escape this week, and all are from well-known developers, each one is brilliant in his own way. You choose whether you want to play one at time or all three games at once and which room you wish to enter first. You simply want to relax a bit, and just solve some puzzles? Yominokagura it is. Something cheerful and positive, energizing effect? Then start with Funkyland. Or do you prefer to dive into a game with atmospheric feel first? How do you want, No1game is waiting for you. 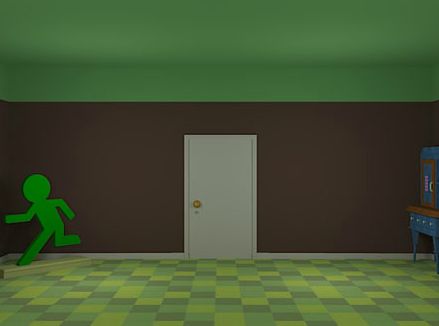 For escaping from this No1game´s room you have to find 10 green escape men. Actually you can see most of the little green guys (no, the big one staying in the corner is not one of them), but they are out of your reach and you need to figure out a way to get them, what requires some deeper and intuitive thinking. The room has a cozy feel and a feel of a mystery. Not a big one, just some small things like an unexpected drawer or a hidden door. It´s more like a place where you would like to spend some time and explore it for fun than a room you wish to escape quickly. The style of the game, music, sounds and cuteness reminds a lot of Sanpoman´s games like Ladybug Room or Hermit Crab Room. The game feels like an enjoyable fusion between Sanpoman and No1game. Before you start, choose a language option (Japanese or English). The cursor is not changing but it doesn't matter, as the developer presents everything clearly. No save button, one ending. If the game doesn't load properly, you may need to check whether your Adblock is disabled. This Yominokagura´s room you are escaping from is a strictly functional room. 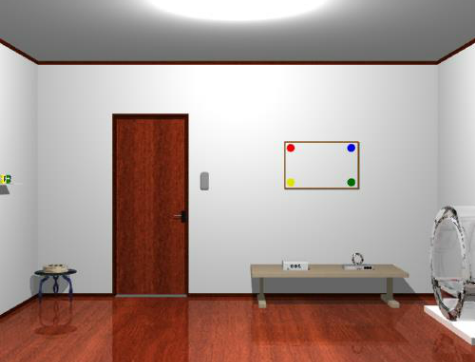 A modest room with a slightly retro look, typical for older escape games, where one is locked in and before leaving simply has to find some hints, break few codes, and open some boxes. The only sound here is the satisfying click after you enter a right code. Yominokagura is a classical escape games´ specialist. His ability to create new and clever puzzles from few ingredients is admirable. The developer keeps producing quality games in the same style: the game is wordless, cursor is changing, no save button, one ending. If there is some undercover interior designer among game developers, it must be someone from Funkyland for sure. Their interiors shine with bright and matching colors, a cheerful tune sounds around, interesting details are catching your eyes and you just want to explore. Puzzles are logical and intuitive, you don´t have to combine items, just look everywhere, maybe twice and follow instructions precisely. The only downside is, that a sudden urge to search you fridge for something sweet, preferably cake, may occur. The game is wordless, cursor is not changing, save button, one ending. I'm surprised that I managed to beat all of these really quick, even the Funkyland one (those usually stump me a lot). There are quite some creative puzzles in each of them! Fiddling around with buttons might give you a better idea of what to look for (or what to look at). Brute forced the cabinet; still don't know where the combination for it was supposed to come from. Am up to six escape men. No idea what to do with the star wand. Looks like I should be putting it on the headless green guy in the bin, but that doesn't work. Also don't know what to do with the white escape guy. I have the square and the circle for the combination, but don't see how to get the diamond. It's all about setting the model in the cabinet right. I STILL don't know how I was supposed to get the cabinet combination. But having brute-forced that one part, I finished the game. And the other two were pretty straightforward. Fun! You will need to adjust the arms and legs of the model in the cupboard 3 times. 1. like the picture on the left. 2. like the headless EM in the box. 3. like the picture on the right with star-head. Find a white EM and color it green. can't wait for the walkthroughs to these 3 games. I brute forced the box on the cabinet, but I still don't understand where it came from. I brute forced it too, and then I looked at the water pot to see if there was a clue there in the coloured bands. If you ignore the light green parts, one of the vertical patterns is pink pink green yellow pink. so that's what's written in this walkthrough. Both the white door and large green Escape Man don't do anything throughout the game, so zoom in on the blue cabinet in the right corner. On the cabinet, there's a door which opens by color code. It has 5 rectangular buttons, or perhaps there's only 3 of them because clicking the top and bottom ones don't do anything. Take a closer look at the photo, which seems to be of an EM attached to the bottom of something. Look in the left drawer to get an object which looks like a green magic wand. The right drawer is empty, so it's time to move on. Back up and turn right. There are two EM pictures on the wall, but they seem to be a little different: their arms are pointing in odd directions and the one on the right has a star-shaped head. In the right corner there's a large pot with a colored rectangular grid on the front. There seems to be a few rectangles missing, but the remaining colors seem to match the color code we need. How do we narrow it down? Keep exploring for now. Open up the pot lid to reveal the number 260 written on its underside, and look in the pot to see an EM submerged in the water. There's a diamond-shaped frame on the wall with an EM on it. Can't reach that yet! Take a closer look at the fireplace. There's an EM in the lower-right corner (can't get that either!) but there's also a white EM hidden on the upper-right corner of the fireplace itself. Zoom in and get it. There's some furniture and a crate. First zoom in on the table and check the photo, which seems to be telling us to lift a purple box. Look under the chair to get an EM (#1). Zoom in on the corner table and look at the purple box, which opens with a three digit code. Look in the crate, which is full of multicolored men. One of these is green (#2) and another is missing a head. Return to the cabinet and put in the color code from the pot. 0 presses for pink, 4 for green, 2 for yellow. The door opens up, revealing a posable EM figure. Take the tongs, and input the color code on the jar lid. This gives you the EM (#3) inside. Go over to the pot and use the tongs to retrieve the submerged EM (#4). Fill the empty jar and use it to put out the fire. Take the EM (#5) from the corner. Go back to the posable model. The remaining EM differ by the position of their arms and legs. For each limb (left arm, right arm, right leg) write 1 for the highest position, 2 for middle and 3 for lowest. So for example, the EM in your inventory and the giant EM in the room have limbs in positions 2,3,1. Adjust the model to match this frame. The frame opens, revealing an EM (#6) and the number 20 written on the back of the door. Adjust the model to match, and remove its head, which turns out to be a green color pencil. Use it to color the white EM (#7). Adjust the model to match, and use the "magic wand" for his head. The frame opens to reveal another EM (#8) and a button. Something will pop out if you press the button. Press it. The EM from the frame lands beside the door (#9). Enter the code on the purple box, and remove the EM (#10) from inside. You beat the game! A box on the table has buttons with S L M, and a clue "6 leftturn 4, 11 rightturn 1", a combination for a lock maybe? Another box on the table has a ring ornament and 3 unclickable buttons, and perhaps slots for something, also unclickable. A circle sculpture has R R L L L R, the letters are coloured red, blue, yellow, red, blue, yellow. Where have we seen these colours before? On the wobbly picture. Alas, clicking those 6 colours doesn't open the picture. The circle sculpture also has a panel with 9 square buttons that can be coloured black or white, a blue line and 4 numbers down the side: 5 1 7 2. A triange sculpture has more R L letters: L L R L R L, coloured red, blue, red, yellow, blue, yellow. Combining those colours with the previous ones still doesn't open the wobbly picture. A clock with rods of different lengths and large medium small balls at each number, with the hands pointing at 3 o'clock. Below the clock is a cupboard that needs a key. Shelves with two rows of three circles, (yellow, blue, red) (blue, green, yellow). Hmm, those are the wobbly picture colours, and green is included this time. Try them in order top to bottom. Nope. Didn't really think that would work anyway. More shelves with 3 rows of 3 blue numbers laid out like like a phone number pad, (1 2 3) (4 5 6) (7 8 9). The clue says to start at 6 and go counterclockwise to 4, start at 11 and go clockwise to 1. It's a number pad. Use the blue numbers on the shelves as a guide. 5 1 7 2. Also a box with 3 letter buttons with a down-triangle below. Look at the paper again. Imagining a line running horizontally across, the hourglass is a down-triangle over an up-triangle. Go back to the puzzle on the stool. Turns out that the up arrows are clickable. There are 6 segments in the path. The star clue has 1 2 3. The 1 2 3 indicate how many segments to follow to each direction. Get a screwdriver and open the panel to the right of the door. Click until a green light and some letters show up. The letters are P S P C P U. Where have we seen these letters? A new puzzle with two buttons and a clue with red circle, triangle, square. We have several L R clues. Take them in the order of where the clues are are? Circle R R L L L R, triangle L L R L R L, square cupboard R L R L L R.
Only take the red ones! It's the key to the door! which gives you the same solution to that clue. arm rotation puzzle. it shows how to position them on the pictures but when I try and do it on escape men for all 3 it never works. what am I doing wrong? in addition to getting to my help in escape men I hope the walkthrough for Cupcake shop is coming. the heads have to match, so you pretty much have to do the arm positions in order. Click on the cabinet, and then the color code box. Click the middle button 4 times and the one below that twice. Open the box to reveal the figure. Click the right leg twice and left arm thrice. You should hear the unlock sound as well as get the text "!?". 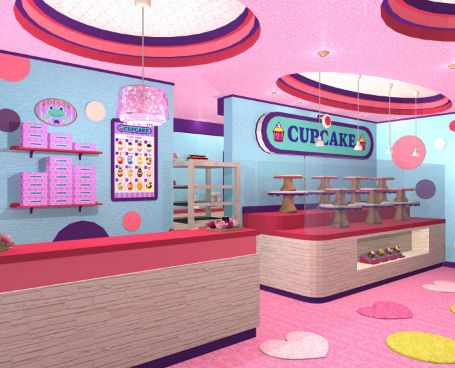 I'm also working on the Cupcake Shop walkthrough, so stay tuned! Don't forget that the + button in the upper right lets you change options, as well as return to the title screen if you want to abandon unsaved progress. As usual, you'll need to open the cupcake shop to escape it. Typical Funkyland. The first screen is already crowded with stuff. On the left, stacks of cupcake boxes with a frog-and-bell sign over them. Could use a little tidying up, those uneven stacks are annoying. Next to that, a menu with 16 cupcakes. That's a lot of cupcakes. And then an oven rack that's blocking the way. I guess we just have to push- wait, who put this rod here and bolted it to the wall? Why would anyone do that? Right side of that wall: a large CUPCAKE sign. What's that on top? A mini dartboard? A Japanese flag? I'd take a closer look, but I'm not climbing on the display to get to that. And then there's four little cupcakes. Considering that we're not open yet, those probably aren't real cupcakes. They have weird golden dots next to them. Turn right. Obviously the exit door is locked, but it's not like we could open the shop anyway, with the kitchen being blocked off. Love the little Christmas tree outside. Next to the door, a round box with 16 buttons in a grid. Then there's a sofa which doesn't have anything on it, and a table with a card on it. A clue! Above the sofa: a box with "welcome!!" written on it, two bells in front with room for a third, and a row of six lights below that. There's a frog in there holding a tray with cupcakes and ...is that a key in there? Turn right. There's two cupboards, one shut and one open. Both don't do anything right now, but the shut one seems to require a handle, and opens downwards. In the corner, there's a picture. Cupid, arrow, heart. How sweet. Oh, and another row of six lights above it. Turn right. There's a machine with five columns, covered in a range of pastel colors. Each column is topped with a pattern: plain purple, pink with thick diagonal stripes, blue polka dots, yellow with narrow horizontal stripes, red cupcake prints. Further toward this corner, there's a box with four buttons. Big round buttons. Pressing those buttons changes their appearance. In the corner there's a cupcake claw machine. It is missing the claw though, and we don't seem to have any money to play. There's a window to the kitchen, and one tasty strawberry cupcake is already sitting there. Take the cupcake from the kitchen window. The four cupcakes from the display correspond to the four-circle grid. The golden dots indicate which button they belong to. Open the box to get a handle. Attach the handle to the left cupboard and pull it down, revealing another cupid clue card. Look in the bottom of the cupboard to get a rolling pin. The previously open right cupboard is now shut, with a cupcake ingredient poster on its front. The corners of the picture are clickable, and the arrow trajectory in the picture is dotted: Cupid Dot Dot Arrow Dot Heart. Those symbols appear on the clue cards. The arrow is in the same position on both clue cards, the lower right corner. It's a corner puzzle: Cupid is lower left, Arrow lower right, Heart upper left and so on. Open the box and get a wrench. Use it to free the oven rack, getting a metal rod in the process. Before entering the kitchen, use the rod on the top of the large CUPCAKE sign to get... whatever that plate thing is. It's a pan for a weighing scale. Enough with puzzles and corners. Let's go to the kitchen. Enter the kitchen, pushing the oven rack on the way in. On the left wall, we have a case with five ribbons which has a space for something below it. On the end of that counter, there's a white device ...with a cylindrical hole and a shelf in it? It's a little weird until you see it in action. On the opposite wall, there's a whiteboard with some order sheets pinned to it. Then there's some ingredients and a weighing scale missing its pan. And then there's a metal cupboard beneath that secured with a 4-digit lock. Time to put things in order! Put the rolling pin in the ribbon case, pulling down its base and letting the ends of the ribbons hang out. Put the strawberry cupcake on the shelf in the white device, causing the whole shelf to slide downwards. There's a pencil in there. Take it. Take the order sheets off the whiteboard. Put the pan on the weighing scale. We can now click ingredients to weigh them. But which ingredients do we need? Check the ingredient poster again: Flour, milk, and two eggs. Flour + Milk + 2 Eggs = 2000 + 1500 + 42 + 42 = 3584. Unlock the metal cabinet and take out five cupcakes on sticks. Each ribbon also has a different length. The blue ribbon is longest, followed by purple, red, pink, yellow. Place the cupcakes on sticks on the five-pattern box outside, and adjust their heights accordingly. From left to right, click them 1, 3, 0, 4, 2 times. The OK button opens up revealing a coin. Take it. Use the pencil on the order sheets in your inventory, revealing check marks: someone ordered cupcakes 1, 2, 5, 7, 10, 12, 14, 15! Note their positions on the cupcake menu, and push the corresponding buttons on the 4x4 grid. The box opens up. Take the claw. Attach the claw to the claw machine, insert a coin, and push the button. A pink frog comes up, holding a bell. Take the bell and place it on the welcome box. Remember the stacks of boxes from the very start? Each stack is a different height, from 1 box to 6 boxes. Take the key and open the shop! Apparently, revealing hidden marks with pencil is a cliched forensic technique, usually indicating that someone had made those check marks on another piece of paper and the indentations got transferred. Since we had two sheets of paper with different marks, they must have been marked separately. So I don't think those eight cupcakes were from the same order.